In the “technology gamesmanship”, AIS is now part of the tech jargon. This column is about that. 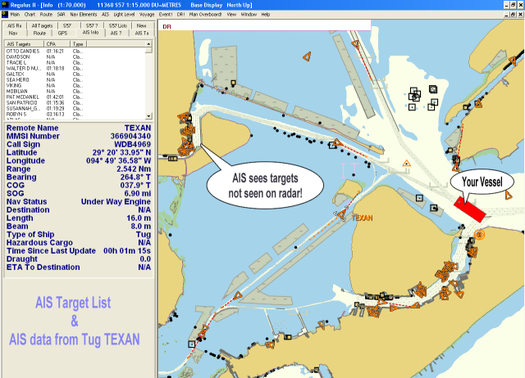 AIS is the Automatic Identification System, operated by the US Coast Guard here in the United States. The International Maritime Organization's (IMO) International Convention for the Safety of Life at Sea (SOLAS) “requires AIS to be fitted aboard international voyaging ships with gross tonnage of 300 or more tons, and all passenger ships regardless of size.” It is estimated that more than 40,000 ships currently carry AIS class A equipment. Clearly, by the prior description, it is and has been intended for the “big boys.” What does it do? 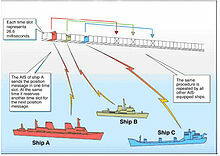 It links all AIS-equipped vessels together via satellite/GPS technology. But any good radar system these days will give you that data. True. If the radar sees the opposing vessel, it can. While many objects can block a radar return, VHF goes in a straight line, to infinity essentially, and won’t be (completely) blocked by bridges, wave or rain scatter and the like. It will even give you the vessel’s name amongst other characteristic information so, when you put out a “security call” during a transit (“secure-a-tay, secure-a-tay, secure-a-tay, this is the M/V Charlie westbound on the rhumb line from Montauk to New York City, all vessels on opposing course, please be advised”), you can say, “Hailing M/V Monica, eastbound on the rhumb line from New York City to Montauk, this is the M/V Charlie on a reciprocal course, 10 miles ahead. Suggest we both go to starboard and open up a lane between us.” That’s technology reducing risks at sea. The US Coast Guard has noted that AIS might replace RACONs, or radar beacons, currently used for electronic navigation aids. And, if buoys and beacons can transmit their data, it will be a further aid when aid is mostly needed – poor visibility and crowded seaways. And don’t be surprised if you hear about Virtual AIS. In one example, an AIS transmission describes the position of buoy but the signal itself originates from a transmitter located in a USCG station miles away and on land. For example, an on-shore base station might broadcast the position of a string of channel markers, each of which is too small to contain a transmitter itself. In another example, AIS could transmit the image of a marker which does not exist physically but now marks a transient situation, like a sunken vessel or channel that had shoaled over. Although such aids would only be visible to AIS-equipped ships, this would be a lot cheaper – and faster – than physical markers. One last thing: AIS “hates” to be close to AIS, meaning, it is self-alarming. You set the perimeter or zone of safety and, if another AIS-equipped boat enters that zone, the alarm goes off. And, on your chart plotter, you see its heading, speed, position and name. Immediately.